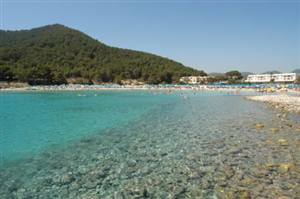 Cala Llonga is located just down the coast from Sta Eulalia and is one of the most popular sandy beaches on the island. It is approximately 200m long and a staggering 100m wide, giving plenty of room at the back of the beach for throwing your frisbee without hitting any unsuspecting sun bathers. All this available space, plus the children’s play area make this an ideal family beach. There are regular buses from Sta Eulalia that make several stops through Cala Llonga and even one right next to the beach itself. Most of the restaurants offer a menu of the day and there are a wide selection to choose from. If you don’t want to get the bus and are fed up of driving everywhere then you can also catch a boat around to Sta Eulalia from the beach. Not only is Cala Llonga a popular beach, it is also a great town in it's own right and it's own supermarkets, bars, restaurants and everything you will need.